Updated Security Protocols at Venue: all guests at the Sumner School should register for this event and check in with Security Officer on Duty prior to entry. Please bring official, government-issued identification. Join Judith N. Freidenberg for a timely discussion about immigration in the United States that centers the complexity of migrant experiences and advocates for seeing immigration as a social issue, rather than a social problem. 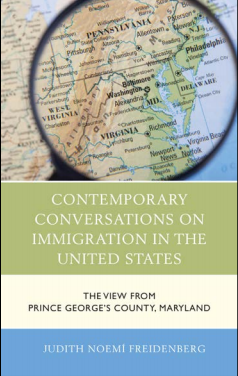 The panel will provide a textured analysis of the larger histories, structures, contexts, and cultural understandings of time and place that not only affect contemporary immigration patterns, but also how we understand, imagine, and frame our discussions of them. Judith Noemí Freidenberg is professor of anthropology at the University of Maryland and Director of The Anthropology of the Immigrant Life Course Research Program. She previously held joint appointments at the City University of New York (Mt. Sinai School of Medicine and Center for Urban Research) where her research on the medical anthropology and community development of a neighborhood culminated in, The Anthropology of Low-Income Urban Enclaves: The Case of East Harlem; (New York Academy of Sciences, 1995), and Growing Old in El Barrio (New York University Press, forthcoming 2000). Her interest in reaching community groups, service providers and policy makers led her to curate a bilingual exhibit of ethnographic and photographic explorations of Spanish Harlem displayed in New York and Mexico City. Since arriving on campus, she has been affiliated with CuSAG, the Center for Latin American Studies, the Center on Aging, the Department of American Studies, and the Department of Women’s Studies. Currently researching health care and employment needs of Latin American immigrant retirees in Langley Park, she coordinates the Network for Latino Research to foster research on social issues affecting local immigrant populations from Latin America.